With the Parrot CK3100, you will be able to place and receive calls in comfort and safety, without ever touching your mobile phone. At a time when legislation is tightening up to restrict the use of mobile phones in vehicles due to safety concerns, the Parrot CK3100's benefits are not just for the sake of convenience and comfort -- they are fast becoming a real necessity. 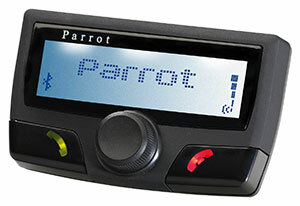 The Parrot CK3100 wirelessly connects with all Bluetooth phones on the market and is compatible with all brands. 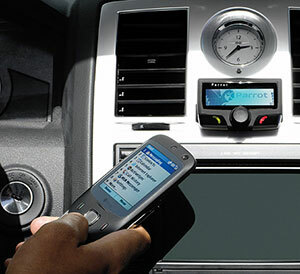 The display of the CK3100 provides the same visual information and functions as your mobile phone, such as caller ID, carrier signal strength, or last calls received, in large well-contrasted digits easy to read at a glance on a screen that can be clipped in the ideal position for the driver to see. 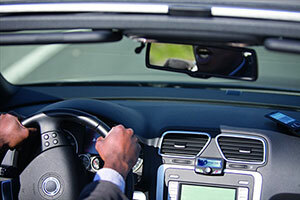 Turn on the car engine and the phone connects wirelessly to the Parrot CK3100 Car Kit. The screen unit has easy-to-navigate menu options just like your phone, and your mobile phone book is wirelessly downloaded to the car kit. Calls can be dialed either through the screen, or by using voice-recognition speed dialing. According to your phone's model and firmware, most features are accessible from the hands free console, including one-touch redial, dual call, and auto-answer. The Parrot CK3100 Bluetooth car kit can be installed in almost any vehicle, and is designed to automatically mute the radio during use. Incorporating high-quality sound, the CK3100 includes both echo cancellation and noise reduction technology. As with all Parrot car-kit devices, the CK3100 Bluetooth car-kit offers the user seamless, hands-free use without the inconvenience of wires, headsets, or cradles. This unit also features user connection priority management for up to five users, up to 200 voice tags for its voice recognition, multi-user use for up to three phones, private conversation mode, and much more.